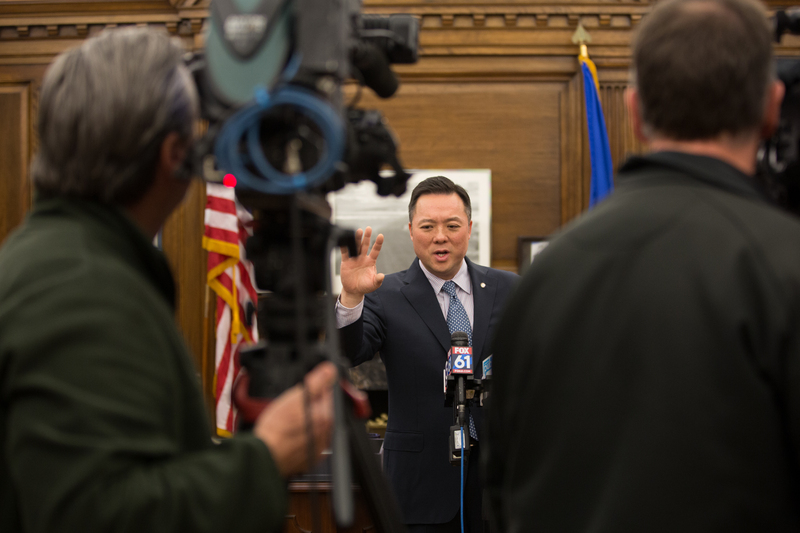 After only a few months on the job, William Tong already seems to be grasping the reality of being Connecticut’s attorney general in the age of Donald Trump: Lots of legal action and the requisite press releases that go with it. An outsized portion of that work continues to involve environmental issues. President Trump, a climate change-denier, has from the beginning of his administration unleashed a cascade of efforts to end, rollback, ease, slow or otherwise thwart environmental rules put in place by his predecessors and promote fossil fuels. A count by the New York Times at the end of 2018 put the attempts at nearly 90. It’s largely fallen to state attorneys general to fight back. And Tong is now part of that fight – filling the void, he said, of the federal government’s failure to enforce the nation’s environmental laws. The State Energy and Environmental Impact Center at NYU School of Law – begun about six months into the Trump administration to help document and offer a coordination database for state attorneys general – counts as of the end of January nearly 200 actions by AGs against Trump environmental actions since 2017, about a quarter of them lawsuits. Last month, the Center followed up with a report that, among other things, shows the impact of Trump actions against just six federal rules that would increase carbon emissions by more than 200 million metric tons a year by 2025. “The Trump administration’s actions amount to a virtual surrender to climate change,” the report said. The Center counts more than 50 actions by Connecticut, most begun by former Attorney General George Jepsen, Tong’s predecessor, who scooped up the initial onslaught with an eye to those with the most direct impacts on Connecticut – mainly involving Clean Air Act-related policies. The highest national profile efforts Connecticut has joined are in support of the Clean Power Plan – the Obama-era regulation of existing power plant carbon emissions. It never went into effect and the Trump administration has since sought to replace it with the Affordable Clean Energy rule, which Connecticut and other states are opposing. Another involves the Trump administration’s attempts to roll back Obama-era fuel economy standards and emissions for cars, along with eliminating the “California Waiver” – the longstanding ability for California and other states, including Connecticut, to set more stringent auto emissions standards. Connecticut is among those states fighting Trump administration efforts to roll back stricter methane emissions requirements and President Obama’s Waters of the U.S. rule under the Clean Water Act. 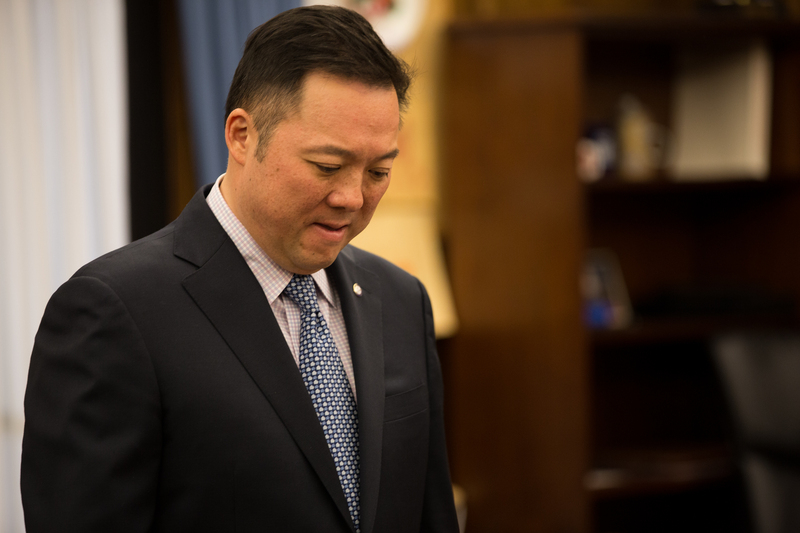 Tong has ratcheted up the pace in his first few months while simultaneously steering clear of some of the high profile western-focused cases that involve topics like public land drilling expansion and easing of Endangered Species Act provisions. Since January, he has continued the effort begun by Jepsen and eight states to prevent seismic testing off the Atlantic coast as part of the Trump administration plan to allow offshore drilling there, which Connecticut also opposes. Tong also joined a 21-state and seven local government group opposing an Environmental Protection Agency plan to weaken greenhouse gas emission standards for new or modified coal power plants. And espousing literally the same words as Jepsen before him and others who talk of the Connecticut AG’s office – that it punches above its weight – he has announced his intention to join one of the biggest of the big legal fights – holding big oil companies accountable for climate change. In March, Tong joined a multi-state group amicus brief supporting San Francisco and Oakland in their suit against BP for the costs of sea level rise. In justifying such action in advance of actually taking it, Tong likened it to the massive and wildly lucrative suits against big tobacco by attorneys general, like Connecticut’s Richard Blumenthal, in the 1990s. He has not, however, joined either a multi-state suit led by Rhode Island against Chevron for knowingly contributing to climate change or New York’s suit against Exxon Mobil, which claims that it misled investors about the risk climate change regulations posed to its business. And while he may be aiming for potential big-payday climate suits, Tong is not forsaking the core of Connecticut’s state-specific and longstanding legal environmental fight with the federal government – a fight that predates Trump, but that has been exacerbated by his administration. It’s about clean air – something Connecticut is perpetually short of. Connecticut has the great misfortune to be located at the convergence of wind patterns from the Midwest and south. They arrive with pollution from both, which still includes the emissions from a lot of old coal plants. In the summer there’s the added attraction of that pollution “cooking” in the hot sun to form ground-level ozone, a major component of smog. Connecticut has the highest monitored ozone values in the eastern U.S., according to Paul Farrell, the assistant director of air planning at the Department of Energy and Environmental Protection, who’s been looking at the numbers for decades. As a result, he said, the state has rarely been in compliance, known as attainment, with ozone standards set by the EPA. The southern part of the state is in non-attainment with 2008 limits, while the entire state is in non-attainment with the more stringent 2015 limits. The state’s ozone exceedance days are certainly nothing like the smog-infused days of the 1970s, but they haven’t been all that great in recent years either – possibly a partial function of hotter summers due to climate change. But Connecticut – and a number of other northeast states – also blame federal officials, who haven’t taken too kindly to that. So there are lawsuits – lots of them. The crux of those legal battles have been to get the EPA to do something about the pollution and ozone coming into Connecticut from other states that are making it impossible for the state to meet the federal ozone standards. One tactic is to get EPA to expand what’s known as the ozone transport region to nine additional states, which would require them to adopt more stringent emissions measures. Another is to get EPA to force upwind states to lower their ozone-causing emissions under the “good neighbor” provision of the Clean Air Act. Then there’s a whole separate suite of suits over the actual ozone standards. And is the Trump administration making it more difficult? For starters, the Clean Power Plan and auto emissions rollbacks could pour more greenhouse gases as well as standard pollutants into the air. But before dealing with the substance of those and other policy changes, a lot of the initial AG efforts have involved process – suing EPA over missing deadlines, for example. That’s been the case with Connecticut’s clean air lawsuits – some of which have been alive for years, going back to the Obama administration, because EPA didn’t do something on time. Tong is inheriting all of it. The request to add states to the ozone transport region, which began in 2013 and went through many twists and turns, was ultimately denied. A multi-state petition for review of the denial has been fully briefed by the DC circuit court and is awaiting a decision. As for the good neighbor issue, EPA decided it did not need to take additional action to compel upwind states to control ozone-causing emissions. In January, Connecticut and other states filed a petition for review to challenge that. The ozone non-attainment issue is done for now. Connecticut and other states were able to force the Trump EPA to make the designations that they had delayed. But because of the federal delay, Connecticut was put into a more serious non-attainment category. And some of the battle could start again when the state misses its deadlines for meeting the 2015 ozone standards – which Farrell said is inevitable. Legally, much of what the state has taken on in environmental challenges the last two years was the easy part. It could get much harder now as the legal matters move into the actual policy provisions and the rule-making around them. This means Connecticut and other states can’t just simply file lawsuits. AGs like Tong and Jepsen before him have to be nimble with their tactics, change them when needed, and use the existing regulatory systems – the rule-making process chief among them. Attorney General William Tong answers questions from the media. When the Trump administration decides to roll back rules or devise new ones, there are prescribed processes that can take years to complete. Experts said it’s important for attorneys general to participate and file comments in ways that will allow them to file suit later if needed. The state’s lawyer also needs to be mindful that even small actions can have large impacts in insidious ways, such as changes to rules for making new rules or tinkering with things like the composition of scientific review panels, which can lead to the loss of both EPA personnel and their expertise. Katrina Kuh, the Haub distinguished professor of environmental law at Pace University said there’s not really one legal avenue for states to follow. “It has to be a full-court press across a dizzying array of statutes and policies,” she said, cautioning that time is also a factor, even with an environmental win. Looming over it all is the prospect that attorneys general like Tong will have to face two even larger challenges. One would be that the Trump administration goes after the bedrock 2009 “endangerment finding” that allows greenhouse gas emissions to be regulated by the EPA. Even though it was affirmed by the Supreme Court, there has been perpetual worry in environmental circles that Trump’s team will find a way to get it back to the court that now tilts in his favor. The other worry is that getting cases to that realigned court is the goal with all the environmental litigation. “It’s very concerning,” Tong said. But he is undaunted – again using the tobacco case as an example. WASHINGTON -- The U.S. House has voted four times to approve bills that would halt the sale of Plum Island, but the Senate has never acted.